APE (Monkey's Audio) is an algorithm and file format for lossless audio data compression. Monkey's Audio does not discard data during the process of encoding, unlike lossy compression methods such as AAC, MP3, Vorbis and Musepack. Data file compression is employed in order to reduce bandwidth, file transfer time, or storage requirements. A digital recording (such as a CD) encoded to the Monkey's Audio format can be decompressed into an identical copy of the original audio data. As with the FLAC and Apple Lossless format, files encoded to Monkey's Audio are typically reduced to about half of the original size, with data transfer rates and bandwidth requirements being reduced accordingly. Monkey's Audio's advantages are better compression rates compared to FLAC and WavPack, as well as multithreading/multicore support. Monkey's Audio main drawbacks are the fact that it employs a symmetric algorithm, meaning the decoding takes comparable resources to encoding, which makes it unsuitable for all but the fastest portable players (via Rockbox firmware), and that it has limited support on software platforms other than Windows; on other platforms only decoding is officially supported by third-party programs. Although the original source code is freely available, the license is not considered to be an open source one. Monkey's Audio files use the filename extension .ape for audio, and .apl for track metadata. Sometimes created with .CUE files to comprise an audio CD image. To play APE file, you need to install an APE player such as foobar2000, Winamp. I'm here to recommend you the foobar2000. As it's free and nice. The important is the freeware burns APE to CD easily. foobar2000 is a convenient and flexible media player that you can load with all of your favorite music and customize to suit your specific needs and preferences. After a bit of setup, you can use this app in just about any way you see fit to manage your media library. Please install the foobar2000 after download completes, and then download and install the Monkey's Audio Decoder component for playing APE file. To install the APE Decoder component, please right-click on the file and choose "Install". Now, the foobar2000 could play the APE and APL files. If there is a CUE file associated with your APE file, please add the CUE file to the foobar2000. The freeware will load the associated APE file with separated tracks. 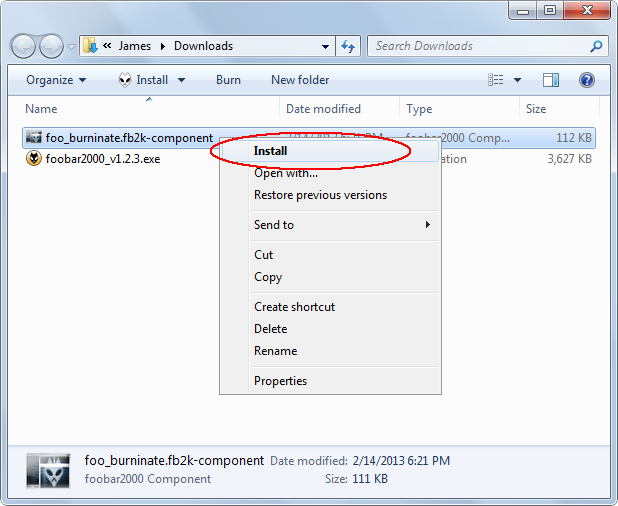 To let foobar2000 burn audio CD, you need to install another component. It's Audio CD Writer. Please download the component from the following link. 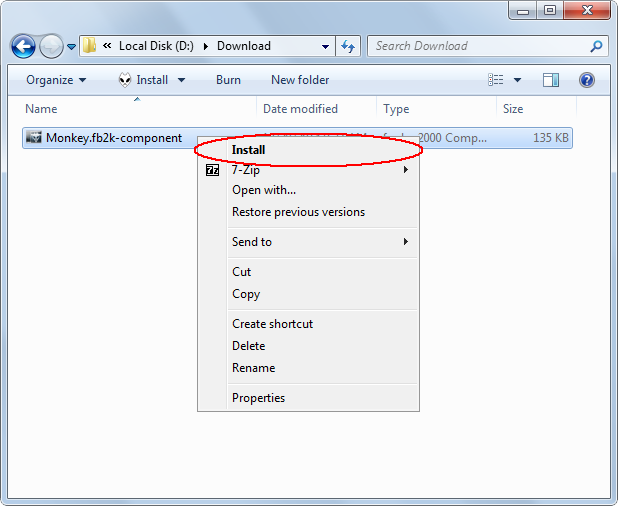 And then, install the component by right-clicking the file and choosing "Install". 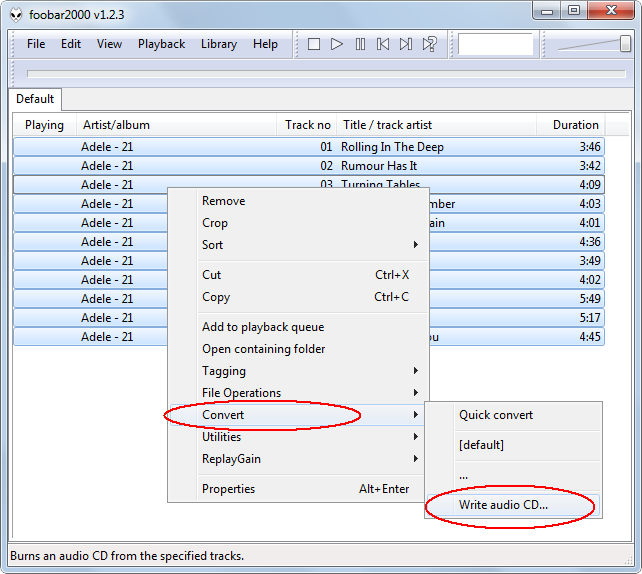 To burn APE to CD, please add the APE files to foobar2000 freeware, and then select the APE files that you want to burn to CD and then right-click on the items and choose "Write audio CD."